Lately, I have been getting what Laura Ingalls Wilder called “itchy feet:” I’m just so itching to get out of the house and explore whatever suits my fancy – and this curiosity is killing me (hence the witty – cough – title of this post). What with teaching, the preps for teaching, the grading, and the work I’m doing on my books and future classes, I haven’t had much time. I did go hunting for some railroad relics this past weekend, and found a few, so I’m not destitute for discoveries, yet. I encountered this ca. 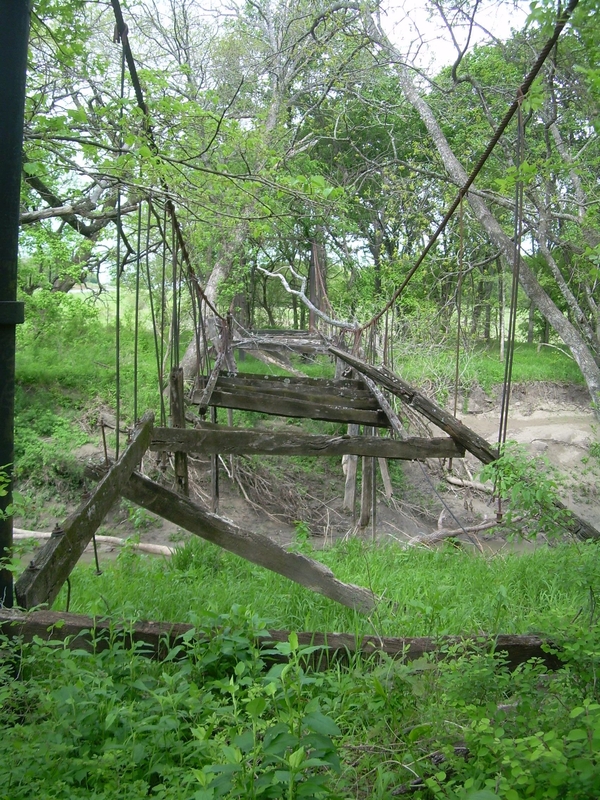 1915 suspension bridge near Sherman, Texas. But I just bought a 1934 Conoco Map of Texas from E-Bay. Good grief, does that make for some interesting reading. Ferry crossings are dotted all along the Red River, as well as old toll bridges that do not exist anymore. I went to Google Maps (thank goodness for satellite imagry) and was able to find remnants of these toll bridges, so guess what I’ll be doing in the near future?! There is nothing in the world that comes close to finding places that time has forgotten. These small pieces of the historical puzzle just fill me with absolute wonder. I don’t think I’ll ever get tired of exploring the backwaters around here. And believe me, there are some real backwaters to explore. I guess my interest in the Red River Valley of Texas, Oklahoma, Arkansas, and Louisiana might seem rather mundane for people who live around really old, settled history – let’s face it, the ghost towns I encounter can’t even hold a candle to the ghosts of Pompeii, and the ruins I photograph are rather puny when compared to the cavernous insane asylums of the Northeast. Yes, consider yourselves envied, you people of the history book places. Still, I LOVE the fact that some of the places I encounter may have never been explored at all – it’s almost pioneer-like, in a way. Like woman on the moon or something. If you happen to read any of these entries and are wondering what the heck I’m talking about, come visit my website, Red River Historian. Also, for a great way to loose yourself for a couple of hours in some fantastic photography and conversation, visit the Urban Exploration Forums. You can also find a kindred spirit in Forgotten New York, a website devoted to exploring the side of New York and its burroughs that urban redevelopment has missed (at least for the moment). If you know of a cool place you think I’d like, or if you’d like to share what you’ve found, just post a comment! 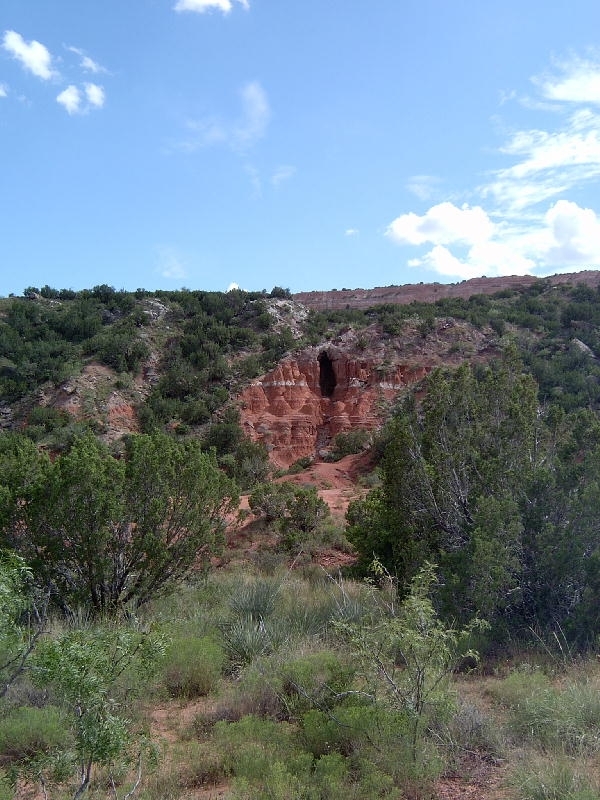 Image above is of Palo Duro Canyon, the second largest canyon in the United States and the birthplace of the Red River. It is located near Amarillo, Texas. Hah, and you thought the Texas panhandle was flat! This is turning out to be an exciting summer. I can’t wait to tell the very, very few people who stumble upon my site about all the planning that is going on here in Red River Historian-ville! First, I bought a Volkswagon Jetta TDI (diesel), and I have begun putting biodiesel B100 in my tank. I now have ca. 80% less emissions than a gas car, and I also get about 40 mpg. Not too shabby! I found a great place for biodiesel in the Dallas/Fort Worth Area, http://www.dfwbiodieselinc.com . The station is located along Long Avenue next to 35 W in Fort Worth. The Sun Travel Plaza in Denton also sells B20, and if you happen to own (or are considering purchasing) a diesel car/truck, you can find out where you can purchase biodiesel in your neck of the woods at http://e85.whipnet.net/alt.fuel/biodiesel.stations.html (this link lists Texas only, but you can snoop around and find your own state). Summer is going to be busy, too. In June, I’ll be attending a workshop in Michigan on the history of the Ford company’s dealings with labor issues. This workshop is sponsored by the National Endowment for the Humanities (http://www.hfcc.edu/landmarks/). I’ve got a ton of reading to get done by the time of the workshop, which will last a week. Hmm, maybe I should be reading instead of blogging…? I also have two, possibly three trips planned, in addition to teaching a summer class. I will be making my final Bonnie and Clyde (see: http://www.redriverhistorian.com/clydeart.html ) trip in June, where I’ll be visiting sites in Oklahoma, Missouri, Kansas, and Iowa. Then, I’m taking the annual pilgrimmage to Galveston to enjoy sun and surf at the Red Neck Riveria. Towards the end of summer, I’m hoping to take a week and a half to travel out west: I want to visit the Petrified Forest National Park (http://www.nps.gov/pefo), Grand Canyon National Park (http://www.nps.gov/grca) , the Bonnie and Clyde Death Car Exhibit at Primm Valley Casino in Nevada (http://www.vegas.com/attractions/outside_lasvegas/getawaycar.html) , Zion National Park (http://www.nps.gov/zion), Durango, Colorado (http://www.durango.org/), and Boise City, Oklahoma, where travelers and cattle drivers left their names on autograph rock along the Santa Fe Trail (http://www.nps.gov/archive/safe/fnl-sft/photos/okpages/phook.htm). I’ve planned the trip so that I can drive through Monument Valley (http://www.monumentvalley.com/), too. Man, I’m hoping that all works out schedule-wise and I’ll be able to do that. Anyway… my books are coming along quite nicely, too. I should have them ready to go by the end of summer, hopefully. Hope that whoever is out there (you are welcome to comment, I won’t bite!) will also have a great, safe, and not-too-hot summer! Would a Rock by Any Other Name… Still be a Rock? One of the archeologists at the Gault Site explains carvings found in the sandstone. 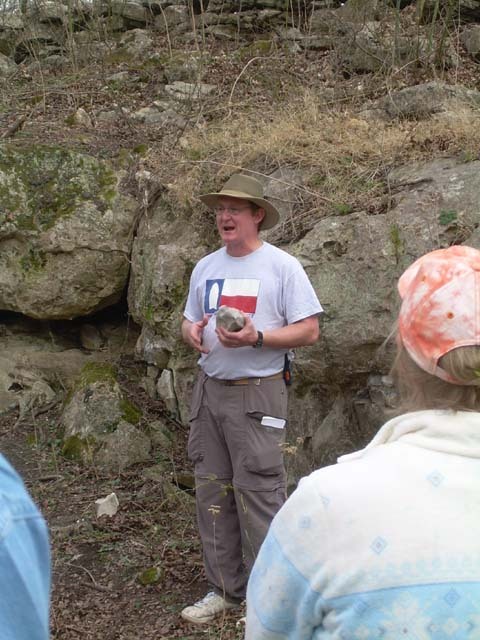 This past weekend I attended a three day class sponsored by the Texas Archeology Society (TAS) (http://www.txarch.org/). I wanted to learn more about archeology and maybe even get a few pointers on how to identify sites, and what to do with them once I did identify them. The academy was held in Belton, TX, a pretty little town with a river running just west of the Main Street. Several archeologists taught a class of about 60 how to probe, map, and survey a site. I was highly amused by the many men at the academy (at least those in my group) who almost had heart attacks when mapping – they were so set on having everything measured precisely to the exact millimeter that we never did get much accomplished. I am not the most detailed person in the world, and when I said that it probably isn’t going to hurt to be a little off, after all it’s just holes we’ll be digging- I think I probably set their hair on fire. On Sunday, we got to put our newly found skills to the test at the Gault Site where all sorts of items from the Clovis culture who inhabited central Texas about 12,000 years ago have been excavated. We’re talking arrow heads and inscribed rock and spear points and the like. At least I think that’s what we were talking about, although I never saw any fully formed artifact. Instead, as these were stone age sites we were probing and surveying, and this was very rocky terrain, everything started to look the same to me! So I ended up mapping random pebbles. Sometimes (and I’m ashamed to admit this), I just kind of ignored a few rocks. I don’t think I was the only one to do that, either, although I must have looked like I knew what I was doing when a woman took me aside and in a hushed voice asked me, “Can you tell the difference between a rock and an artifact?” I really, really, really wanted to say “Of course!” and receive the admiration that is due a serious student of the Archaic period, but I just ended up shrugging and shaking my head. On the plus side, the weather was excellent. There was also a lot of food. The TAS catered breakfast and lunch, with free drinks all day. I realize that if there’s one thing archeologists don’t do, is starve. I also got to spend Friday and Saturday night at a good friend’s house, which saved me hotel money. On Saturday night, because we’re so wild and crazy, we watched “Volver” with Penelope Cruz and directed by Pedro Almodovar. Excellent movie, by the way. I haven’t really made up my mind yet if I want to attend any more academies. On the one hand, it’s very informative. On the other hand, it’s rock. I think I’d be a lot more fascinated by historical artifacts. There’s only so much enthusiasm one can catch for burnt rock middens with crushed mussels littering the pits, and unfortunately I didn’t catch much. 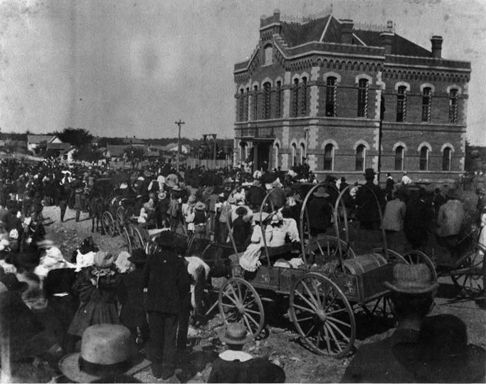 A crowd strains its collective neck to watch the last public hanging at the jail in Denton, Texas (the jail is no longer there, having succumbed to a parking lot). I’m giving a class about “Bad History” right now. No, not “bad” as in “many errors and too much traditionalist interpretations,” but “bad” as in: seedy stuff, women who took the wrong paths, outlaws, and so forth. It’s a broad topic and very interesting. I learned quite a bit about the seedy side of Dallas and Fort Worth. Talk about your “bad” towns!